The product is obtained from organic broccoli, grown and harvested by hand in the cooperative lands. The product is selected again, flavored and packaged in the jar. 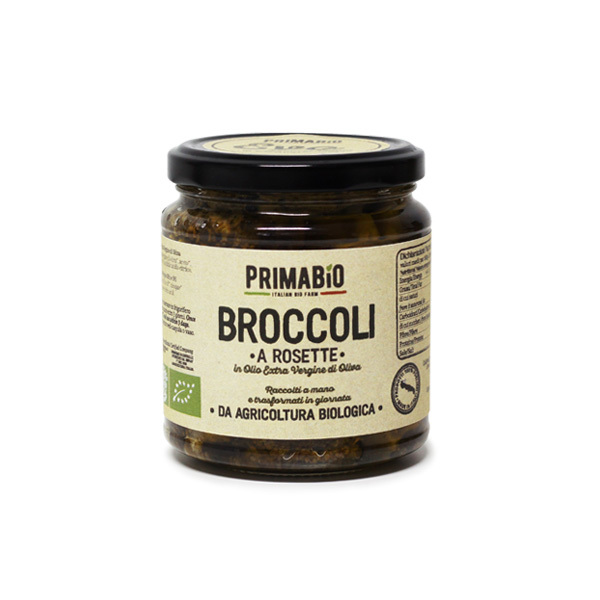 The organic broccoli in oil of Prima Bio are carefully cleaned, selecting the most tender pieces, and then blanched in water and vinegar and preserved in organic extra virgin olive oil from Apulian region to enhance the authentic flavor and not cover the delicate taste. They are excellent as side dishes and are also used for the preparation of first courses with pasta simply adding chili pepper. 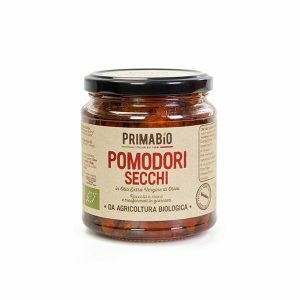 The organic sun-dried tomatoes of Prima Bio, harvested by hand in our fields, are produced by the addition of aromatic herbs and extra virgin olive oil from Apulian region. The packaging process is very attentive and follows the tradition: the tomatoes are carefully checked at the beginning to ensure that the drying process is optimal. Tutti the process ensures to the sun-dried tomato a long-lasting flavor. Great as an aperitif or a side dish, and also to season different preparations or enrich first courses with sauces. The product is obtained from tomatoes, cultivated and harvested by hand in the cooperative lands, transported in the plant in few hours, washed, selected, calibrated, cut in half with a special cutter, salted and finally dried in special greenhouses. The dried product is reselected, flavored and packed in jars. 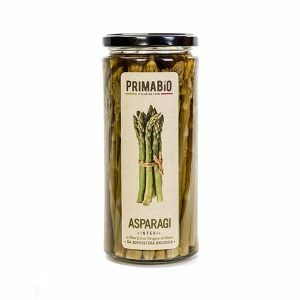 The product is obtained from asparagus, cultivated and harvested by hand in the cooperative lands, transported in a few hours in the plant, selected, cut into large pieces, lightly cooked in a suitable solution to ensure the right degree of sapidity and acidity. The product is reselected, flavored and packaged in jars. The product is obtained from organic pumpkins, cultivated and harvested by hand in the cooperative lands. It is selected again, flavored and packaged in the jar. The organic diced pumpkin in oil of Prima Bio is simply blanched in water and vinegar and preserved in organic extra virgin olive oil from Apulian region to enhance its freshness. This product is the result of careful craftsmanship, it is excellent as a side dish, it can also be used to season an excellent first course or directly combined with tasty sheep or goat’s cheese. 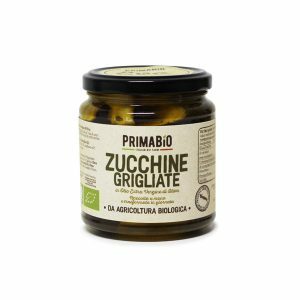 The product is obtained from organic zucchini, cultivated and harvested by hand in the cooperative lands. The product is then cleaned, cut into pieces, grilled and packaged in the jar. 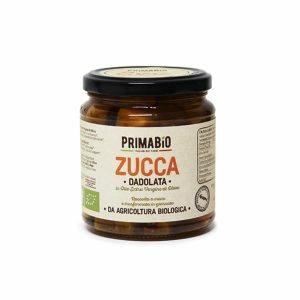 The grilled zucchini in oil of Prima Bio, when they are ripe, are carefully controlled throughout the process, from sowing up to the final product. We choose only the most tender and tasty ones. The pasteurization and packaging process takes place at low temperatures to not altering the characteristics of the ingredients. They are then preserved in organic extra virgin olive oil from Apulian region, adding aromas and wine vinegar to give the product an intense and genuine taste. 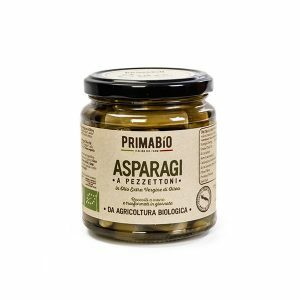 The product is made from our asparagus, grown and harvested by hand in our lands, transported in few hours in the plant, selected, cleaned from the hardest and most fibrous part, lightly cooked in a suitable solution to ensure the right degree of sapidity and acidity. The product is reselected, flavored and packaged in jars.